After cycling past Christiania and along a bumpy road into a more derelict part of Copenhagen’s docklands, we meet Michael Knoth outside this imposing barrel room. Home to the company’s new sour and wild beer project, we’re excited to learn more. The company’s Production Manager, he is a veteran of Danish brewing. Having founded and sold the very successful Gourmet Brewery some years ago, he first came across Mikkel when he was still a home-brewing schoolteacher. ”He asked me to contract brew Beer Geek Breakfast for him,” he says. “After he told me the recipe, I said ‘you can’t do that!’ But, I agreed to brew it and now look at him!”, he laughs. 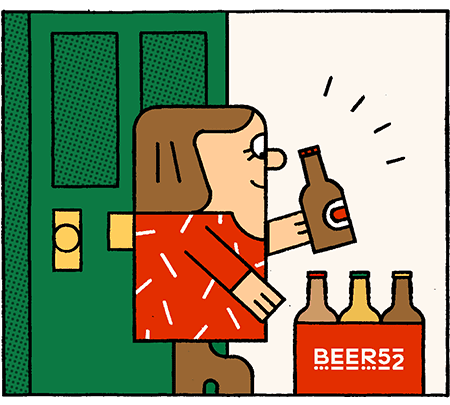 Heading up this latest imprint by Mikkeller on the Copenhagen drinking landscape, he explains the background to what at first seems like an unlikely move: “15 years ago, this whole area was very alive”. Looking around now, it’s hard to see much evidence of life at all. ”Before shipbuilding moved to South Korea, this piece of artificial land was home to civil shipyards and all kinds of factories making parts for boats,” he explains. Long since abandoned, the warehouses and engine rooms have been bought up by an imaginative consortium of developers, including the likes of Danish pension funds. The site is flanked on one side by the water and on the other by the famous Bjarke Ingels-designed trash incinerating power station, which has an artificial ski slope on its roof. “I think the idea is that after a certain number of kilos of CO2 it saves, the chimneys blow a smoke-ring,” Michael tells us. I guess you could say that Danes aren’t afraid of having ambitious ideas. The developers’ plan is ultimately for the area to become a desirable waterfront residential neighbourhood, with a sense of community and lots of great bars and restaurants. But, they know that to get there, they first need to put this block of reclaimed land on the map. Renting out buildings to artists, food entrepreneurs and the likes of Mikkeller, they hope to be pulling in large crowds of visitors to the area starting in earnest this summer. Moored on the harbour walls nearby are various houseboats, “This one is a sort of - how do you say - hippie commune,” Michael says pointing at a colourful wooden vessel. “A short walk from here is Paper Island, a hot spot for food trucks and foodies”. Clearly, these ramshackle waterfront properties have been turned into flourishing destinations before. Along with others, the city’s famous Michelin-starred Noma restaurant is even moving to a nearby area of the docklands. And it might not take that long, knowing the speed at which Mikkeller moves. “We’ll be having the grand opening as part of MBCC,” Michael tells us, seemingly unfazed by the fact that the festival is mere weeks away. There are a couple of scrap cars to move and a kitchen and bar to fit out, but the vision for what they want this place to be is very clear. ”We’ll have plenty of outdoor seating and big concrete blocks for people to hang out on when its warm, but also tables indoors so that we can host various events and parties,” Michael explains as he shows us around the building. A former pipe workshop, it has that ‘distressed’ vibe of peeling paint and exposed brickwork that many a bar has tried to recreate. Only, this is the real thing, thanks to its maybe a century of industrial service. Around the back, a classic car mechanic is in the middle of moving his old vehicles to a nearby garage so that his unit can be cleaned up and fitted with a spotless kitchen and packaging line. “We’ll have a window onto this from the street so that passers-by can see bottles being filled”. The bar itself is already home to an array of barrels and foeders, which will be used to age all kinds of different Mikkeller beers and collaborations in the years to come. Michael takes a lot of pleasure in telling us about their latest toy, which is parked outside - a mobile koelschip (an open-air vessel used to spontaneously ferment beer). Looking something like a steel burger van for now, it’s appearance doesn’t quite do justice to the innovation that it represents. “What we’ll be able to do with this is go to interesting places to brew wort and then spontaneously ferment it - we could drive it to Belgium and collect some wild Lambic yeast for example”, Michael explains. In the meantime, this custom-built trailer is used to transport freshly brewed beer from Warpigs to Baghaven for filling. Once the foeders have worked their magic on the liquid, it’ll be over to Mikkeller’s Master Blender to create the finished beers in the blending tanks, before being pumped into a champagne bottle filler. For visitors to MBCC, the best way to get there is by bike or taxi, but Michael hopes that one day the public waterbus will be able to stop here, “These things take a while, but it would be a dream if you could jump on a ferry from town and just hop across the water to here.” With a view across the water to Copenhagen’s old town and the famous ‘Little Mermaid’ statue, it’s easy to see how this spot will soon become the perfect place to enjoy great beers in the sunshine.